Combat handles about how you would expect from a throwback brawler. You’ve got all the classics: punching, kicking, jump-punching, jump-kicking… you get the idea. To complement the standard stable of moves, you’re placed into a fairly interactive world. In addition to picking up baseball bats, whips, and ‘fro picks (which can be used like ninja stars) from enemies, there are plenty of explosive barrels and other oddities lying around just waiting to be hurled at the next group of marauding dominatrices. Combat overall has an incredibly satisfying “crunchiness” to it. There’s a great attention to detail, including things like the screen giving a delightful little shake when you land a hard blow on an enemy. However, the parts of combat that sound the most interesting are the parts we didn’t get to see. 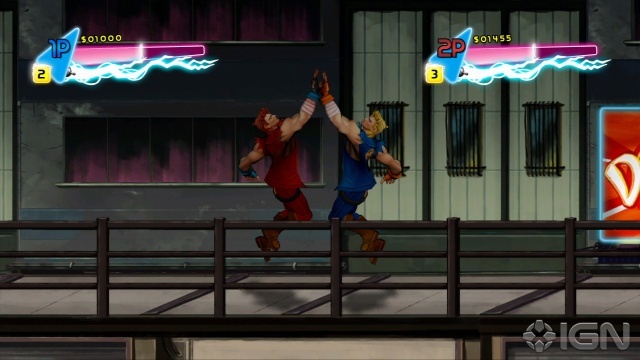 First up is the highly-touted high five system, which allows players to give each other a little skin, as well as either some health or some energy, depending on what kind of bro slap is attempted. Speaking of energy, the combat system also features a variety of special moves and attacks, which can be bought in stores and used to build a “mixtape” of available abilities. One of the only complaints I heard on the show floor was that the game looked slow. If you’re looking for a fast paced game like Castle Crashers, you’re not going to find it here – but that’s in no way a bad thing! Rosky told us they were going for a middle ground between the methodicalness of the original game and faster modern brawlers, and for those of us who took the time to actually play, Wayforward seemed to have met the challenge well. Sprinting has been mapped to an actual button, which makes it far easier to use, and the pacing of battles keeps things moving smoothly along. 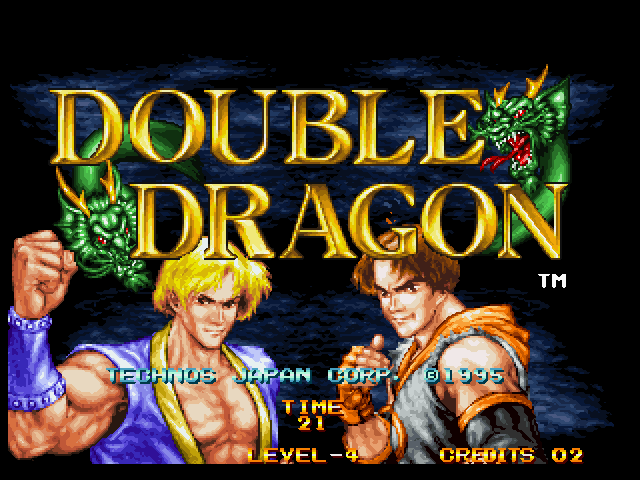 What I saw of Double Dragon Neon at PAX left me with the impression of solid gameplay mixed with a heavy dose of ’80s awesomeness and the promise of some interesting new mechanics. With the resurgence of classic beat ’em ups such as The Simpsons and X-men Arcade, it would not surprise me one bit if this reimagination of a beloved franchise found a place amongst its brethren on XBLA. However, with promising upcoming titles like Charlie Murder also vying for the hearts of gamers everywhere, this year is lining up to be a brawler of its own.